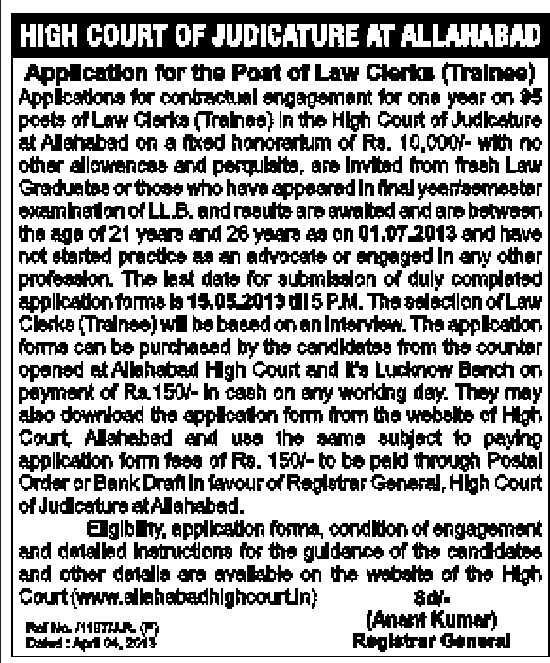 High Court of Judicature at Allahabad now invites application form for the post of Law clerk Trainee. There are all total 95 post posts of law clerk trainee in High Court Judicature Allahabad. Candidates selected for law clerk will be appointed on contract basis. Salary of 10 thousands per month will be given during the contract period . No other allowance will be permissible. Education qualification: all law graduate who have appeared in their final year / semester examination of LL.b and waiting their result can apply for Law clerk. Selection procedure: selection of eligible candidates will be strictly based on interview test. How to Apply: candidates can fill application form in prescribed application form format. Application form will be available on the counter of Allahabad High court and Lucknow Bench counter. Just purchase it to High court .